Mount Peter is the perfect place to bring your group, whether you’re getting together for a family reunion or a corporate outing; with your scout troop, religious group or fun-loving crew of any kind! Our group rates extend to anyone bringing 15 people or more. Group leaders even receive a complementary ticket for every 15 paid skiers/snowboarders. We know you’ll have a great time enjoying the slopes, bonding over some hot chocolate and making lasting memories. For first time beginners (age 5 & up for skiers, 6 & up for snowboarders). The Mount Peter Rental Shop offers group rentals of skis, poles, snowboards, boots and helmets on a first come, first served basis. Group rentals cannot be reserved, so plan to arrive early if people in your group require rentals. Group leaders are responsible for providing a security deposit, including valid driver’s license and credit card, for all rental equipment. The group leader is also responsible for the return of all rental equipment before the group departs. Security deposit will be returned when equipment is returned. Rentals require a major credit card and valid driver's license for security deposit. You must be 18 to sign for your own equipment. A parent/guardian must sign for anyone under the age of 18. NYS Sales Tax not included in price. Your group must include 15 or more skiers and/or snowboarders. How do you schedule a group outing? Reservations for group outings are required. You must call 5 days in advance of your arrival to book, and confirmation of your group’s head count must be confirmed 3 days prior to arrival. A $100 deposit is required at the time of booking. Accepted payment methods include cash, check and credit card. Certain conditions apply. Call Mount Peter and ask for Group Sales: (845) 986-4940. A Mount Peter representative will greet your group and answer all your questions. 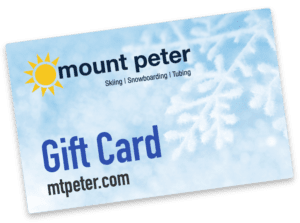 All tickets must be paid for in a single transaction at Mount Peter’s Customer Service counter, and the group leader is responsible for collecting all funds from group members. The group leader will distribute all lift tickets, lesson tickets and rental forms. As a thank you, the group leader will receive 1 complementary ticket for every 15 paid skiers/snowboarders. A $100 deposit is required at the time of booking, a credit card may be used. For payment - methods accepted are cash or check. All rates and programs subject to change without notice. Rates do not include NYS sales tax. Restrictions apply. Please call for more information: (845) 986-4940.